The cost depends on the size and weight of tiles purchased. The combined cost for multiple tiles is calculated by the total weight of the tiles. The smaller tiles are 6mm-7mm in thickness and the large sizes such as 12x12 and 11x14 are 7mm-8mm. this makes them comparable with standard plain tiles. They are perfectly suitable for use where they are not continually submerged in water. We have many customers who have tiled their complete bathrooms and showers using our tiles. They are fine provided they are not exposed to direct flame or directly opposite the source of heat. They can be used behind a cooker as a decorative splashback without problem. Although we offer no guarantee on the tiles where used outside they are perfectly suitable for all conditions except severe frost. If they are to be displayed outside they should not be fixed with tile adhesive as this does not permit expansion and contraction in fluctuating temperatures. We wrap every tile over 8x12 in thick bubblewrap and then place them in boxes lined with polystyrene loose fill. The wrapped tiles are packed to prevent them from moving around during transit. We use strong double thickness cardboard boxes that are securely taped with parcel and Fragile tapes. We will offer a replacement tile free of charge and will ask for a photo of the broken tile to be emailed or text to us to use with our claim to the Royal Mail for the damage. No we don't. We supply our tiles from a small warehouse and we sell only through the website and a string of stockists throughout Scotland. You can, however, visit the warehouse to view our full range. Please call before visiting as we may be out of the office. We have our tiles hand made exclusively for us to our own designs. 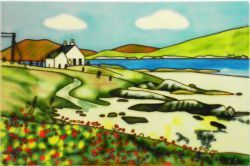 Many of our designs originate from various artists who paint Scottish scenes or create their paintings from their own vivid imagination! We also create our own designs from photographs taken of well known landmarks and views from around Scotland, but especially the Highlands and Islands. Our collection of unique designs are then hand painted on to ceramic tiles by our partner in China, where ceramic painting on to tube lined tiles is still a highly skilled profession. These skills have been passed down through generations and the quality of work is unrivalled. The plain tile, or biscuit, is made and fired briefly to harden and then the design outline is drawn on to the tile. The raised lines, or tubelining, is then applied to give the design its profile and to add detail and depth. The tile is then hand painted, and once dry the glaze is added. Finally, the tile is fired at 1000 deg C for about 12 hours and then allowed to cool slowly for another 12 hours before being removed from the kiln. The backing, complete with hanging hook, is then glued to the rear of the tile. No we do not produce single bespoke designs due to the cost and disruption of producing one-off tiles, however, we can produce a bespoke design for a company or organisation. It is quite normal for a tile to have very slight crazing in the tile glaze. This occurs occasionally as a tile cools, but it does not weaken the tile and will not deteriorate over time. When the tile is viewed at a normal distance of over 1m the crazing will not be visible. We will ship anywhere that we can get a courier to deliver to, this includes the whole of Europe, N America, Canada, Australia and New Zealand. If you live elsewhere please contact us prior to ordering so that we can confirm whether delivery is possible.